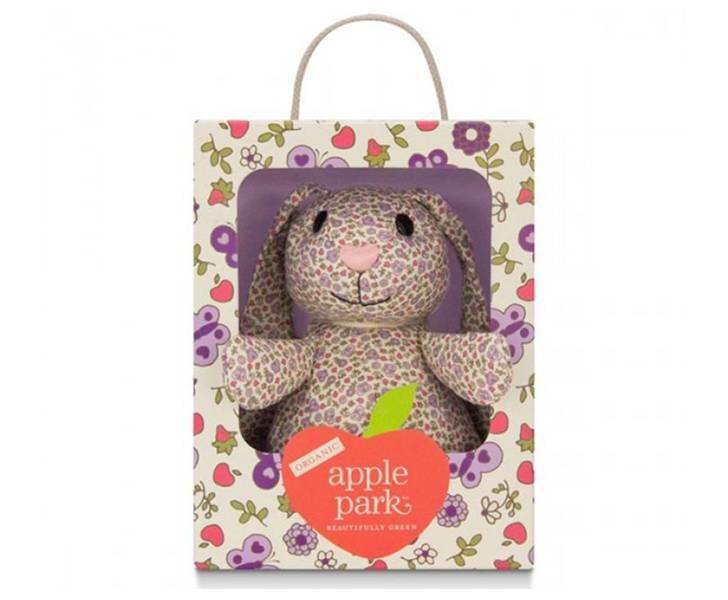 These cuddly bunny pals from Apple Park are made from 100% organic cotton and organic cotton fiber filling, and any child would be delighted to find one in his/her Easter basket. Super soft and cozy, this bunny buddy will win over your child’s heart with its adorable floppy ears, warm black eyes, and heart-shaped silk nose. Three beautiful organic colored bunnies to choose from, including prints of blue forest, pink floral, or purple garden. Each bunny pal comes in a darling recycled gift box printed with soy inks too! These cuddly bunny pals from Apple Park are made from 100% organic cotton and organic cotton fiber filling, and any child would be delighted to find one in his/her Easter basket. Super soft and cozy, this bunny buddy will win over your child's heart with its adorable floppy ears, warm black eyes, and heart-shaped silk nose. Three beautiful organic colored bunnies to choose from, including prints of blue forest, pink floral, or purple garden. Each bunny pal comes in a darling recycled gift box printed with soy inks too!